Earlier this week, I received email regrets from the Boston Athletic Association (BAA). Like Starkist being picky about it’s tuna, the BAA is picky about who they are inviting to next year’s party at Hopkinton. Well, I’m not rushing out to jump through the new fire lit hoops they’ve set out as the tougher qualification standards only to be on the invited list again. Some day, I may be happy to play that game, but not now. As you know, I don’t do well with the “not good enough” message. I’d rather go where I’m wanted. The question is: Where is that? 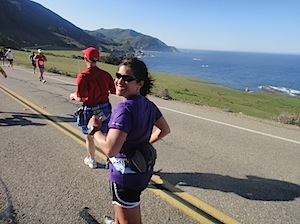 I’ve been watching the BAA registration and Facebook page for updates on registration for the 2012 race. 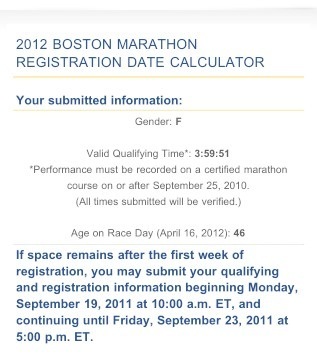 Honestly, I’d love to be in the running to be there on Patriot’s Day 2012 to “race” not “run” the Boston Marathon. The way things are looking, it’s not going to happen. With the new registration process, I don’t stand a chance. I’d be lying if I said that I didn’t care. To be perfectly honest, I am truly disappointed. Last year, after pushing myself harder where I ever thought I could, I BQ’d with the knowledge that I’d have a shot at not one but two Boston Marathons. It’s the magic of timing your race within 18 months of two Patriot’s Days. I never dreamed that the rules would change. I know what you’re thinking and, yes I did run in this year’s race. 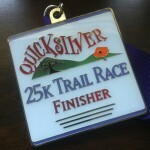 Call me greedy, but I want to run again…on the same BQ used to run this year. I’m okay with the BAA changing the qualification standards for 2013 and onward. I understand their need to make some changes. It’s the tiered registration process that I have an issue with. No, more accurately, it’s the sifting through the registrants who have jumped through all the hoops set out before us (the BQ, waiting our turn to register based on the amount of cushion in our BQ) to find the cream of the crop. It’s a race; it’s not the Olympics. Well, what do you think? You can be honest. Tell me if you think I’m FOS. Just give me the rationale for your thoughts too. 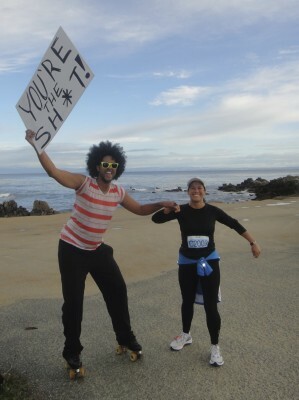 Having never before run two marathons so close together, my pre-marathon feelings were a mix of contrasting sentiment. I was apprehensive yet confident, excited but also calm. With YaYa heading off to Science Camp the day after my return home, packing efforts were focused on gathering the items on his list which we did not currently posses. My packing needs came last. My suitcase was only partially unpacked between races, and I guess I thought this was better than emptying everything out completely and starting anew. Items were washed and returned to the collection of necessities with the exception of my race day attire. This would need to be different as the weather in Monterey can really warm up. Of course, true to form, I threw in all possible options (just in case): long-sleeved, short-sleeved, and sleeveless shirts; shorts, tights, and skort. I even made a list of Bare Necessities to ease in the process. But with all the laundry and packing for YaYa and me, I failed to check my own list of required items against the contents of my suitcase. Thus, I left behind my jogbra, earbuds (for my newly created playlist), and sweatpants and thanks to arriving late to the expo, dinner, and the hotel, this was not discovered until race morning. Yeah, not good. Wearing my PJs over my shorts, I arrived at the starting line looking like I’d just rolled out of bed. To tell you the truth, at the time we had to get up, I’d wished that I’d just rolled out of bed. 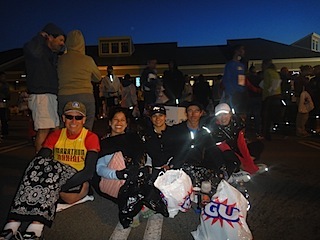 We huddled together making small talk with the other runners and trying to stay warm. Mother Nature was having none of that. It was COLD. Forever and a day later, it was finally time to pee-once-more, peel off my PJs, then join the lineup. The first mile was run at an easy pace with care to find the smoothest sections of the roadway as my feet remained numb from the morning cold. I picked it up only after the feeling returned to my feet. Many runners congratulated me on Boston as they passed by me, after reading the back of my Boston to Big Sur training shirt. How cool was that? 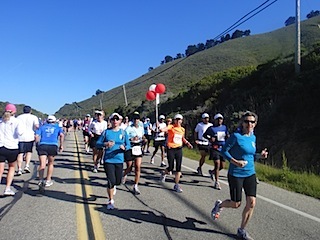 As is always the case at Big Sur, runners were all were treated to the sights and smells of seaside and forest. Each mile was clearly marked. Volunteers were encouraging and plentiful. The music along the way was uplifting and fun. Everything seemed to be thought of in spite of the last minute change in course due to the March 16th landslide. Better still, everyone was cheery – even when greeted by the dead skunk in the road. 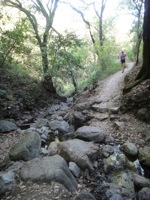 By the time I reached Rocky Point, I was feeling signs of wear. Returning ankle pain reminded me that I’d run the Boston Marathon 13 days prior. The cambered road wasn’t helping. At mile 16, I was in dire need of a cheery “hello.” I called my right-hand man and jokingly told him that I would “not be qualifying for Boston.” We both laughed. I whined a bit and then returned to the business at hand. 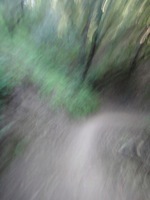 A bit further down the line, I could see the Cliff Pace Teams passing by. Knowing that my friend, Debbra would be leading the 5:30 group, I waited to duck into the potty until after I caught a glimpse of her in doing her thing. Debbra, having completed the B2BS Challenge in 2010, when there was only 6 days between Boston and Big Sur, was the inspiration behind my signing up for the challenge. I greeted her with a “Debbraaaa! You ROCK!” because she does. Then, I snapped a photo as we passed. Her smile was refreshing and energizing.